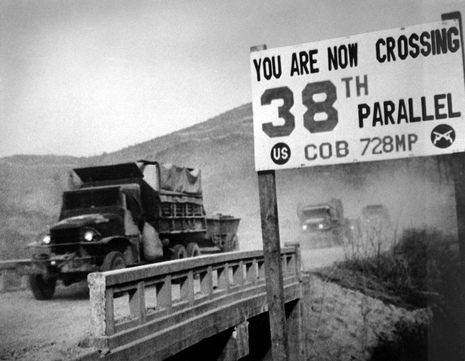 The Battle of Osan was the first engagement between United States and North Korean forces during the Korean War. U.S. Task Force Smith of 540 men suffered 180 casualties while inflicting about 120 casualties on the North Korean force and delaying them half a day. Approximately 3 a.m. Task Force Smith reached the selected defense positions approximately 2-1/2 miles north of Osan and began digging in. The 52nd Field Artillery guns dug in a mile and half or so to the south of TFS positions with one gun dug in a half mile to TFS's rear. This one gun had all the High-Explosive Anti-Tank (HEAT) rounds the artillery had brought with them - 7 rounds. A little after 7 a.m. a North Korean tank column, with a few infantry riding, was spotted coming the road. 8:16 a.m. the 52nd Field fired the first artillery rounds by an American unit of the Korean War at the advancing T-34 tanks. Artillery fire was accurate but ineffective against the tanks as was fire from the 75mm recoilless rifles and 2.36" Bazookas fired at the tanks as they continued without stopping past Task Force Smith defenses and continued south. It did, however, kill or wound most of the infantry on the tanks. Two T-34 tanks were disabled but were pushed off the road. In total, 33 T-34 tanks went through Task Force Smith infantry positions by 9 a.m and through the 52nd artillery positions by 10:15 a.m and continued on toward Osan.